The new Nissan 370Z roadster joins the identically powered 370Z coupe launched last May, and adds joyful open-air motoring to the successful, sporty package. 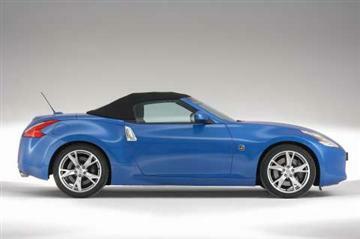 Highly specified and equipped with a new fast-folding fully automatic roof, the new roadster is a genuine sports car. With its shorter wheelbase, lighter weight and advanced 245 kW, 3.7 litre V6 engine, the new 370Z roadster delivers remarkably high levels of sports acceleration and handling, teamed with a comfortable, bluster-free interior. Nissan Australia introduces the new 370Z roadster, featuring an identical mechanical package to the much lauded, highly successful 370Z Coupe, which has already exceeded sales forecasts in Australia with more than 800 sold since its launch in mid-2009. Designed from the ground-up as a roadster to appeal to authentic sports car buyers as well as sun-lovers, the new Nissan 370Z roadster is a taut handling, smooth-riding two-seater that promises whip-crack acceleration, precision steering and secure rear-wheel drive traction for thrilling driving experiences. Lowering or raising the roof takes a swift 20 seconds (easily completed at the traffic lights) and is controlled by either a centre console-mounted switch or a button located on the doors. The folding top attaches neatly to the top of the windscreen header rail while inside, occupants will appreciate a new lining which conceals the roof spars from view and provides greater noise insulation. 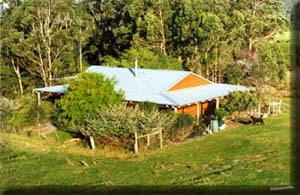 The canvass roof design dispenses with hand operates locks and produces a taught, linear seal. Compared with its predecessor, the new Nissan 370Z roadster boasts a larger glass rear window, electrically heated and the fixed glass wind deflector between the rear head restraints, reducing buffeting with the roof stowed, is retained. The front of the roadster is identical to that of the 370Z Coupe, but the roofline adopts a sleeker look compared with its predecessor, thanks to a gentler rearward slope. With the roof stowed, the profile is sporty, enhanced by the shorter wheelbase bringing the rear wheels closer to the occupants. The generous curves of the rear arches recall classic sports car profiles. The rear deck is comprised of a boot lid, hosting the radio aerial at its centre, and the moulded tonneau, which rises to swallow or release the soft-top. 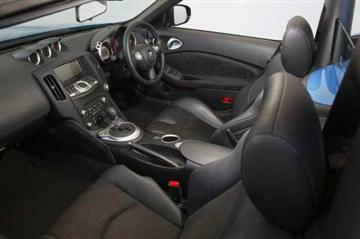 The tonneau is moulded to amplify the two-seater experience. By retaining a soft-top design, the boot is able to swallow a full-size golf bag and some weekend luggage. The soft-top is also a lighter and more flexible solution compared to a folding hard-top. Performance is similar to that of the Z Coupe. An identical 245 kW of power is available at 7,000 rpm from the VQ37VHR 3.7 litre DOHC V6 award-winning engine, assisted by Variable Valve Event and Lift Control (VVEL). A maximum torque of 363 Nm is on offer at 5,200 rpm. Just as with the 370Z Coupe, the roadster offers a close-ratio six-speed manual transmission as standard with the option of a seven-speed automatic. The manual is fitted with the celebrated SynchroRev Match, the world’s first synchronised rev matching system, while the automatic sports a similar system called Downshift Rev Matching giving the driver perfect gear changes and a sporty driving experience. 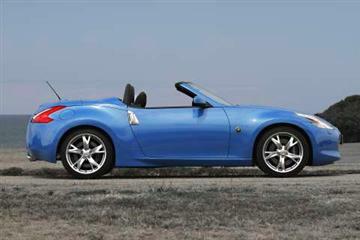 The Nissan 370Z roadster was designed concurrently with the Coupe, and so requires only modest chassis modification resulting from the deletion of the metal roof. A taut body structure with high rigidity and impressive collision safety appropriate for a convertible is achieved by strengthening the door and boot openings as well as the A-pillars and side sills. Driving stability is enhanced thanks to considerably improved torsional rigidity (up to 60 per cent compared with the previous model). The new 370Z roadster is 25 kg lighter than the 350Z roadster it replaces and only 55 kg heavier than the 370Z coupe automatic (manual 60 kg heavier), thanks to savvy engineering at the start of the programme. A rich palette of eight body colours is on offer from launch, including two all new options: Bordeaux and 40th Anniversary Quartz. The coupe’s signature Chicane Yellow, and Titanium Silver, are no longer available. 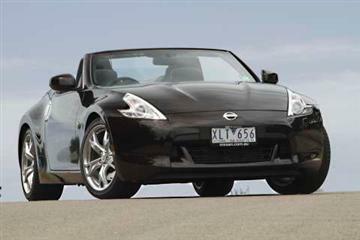 Like the Z Coupe, the new Nissan 370Z roadster is available in Australia in only one model, specified to a very high level. The 370Z roadster with six-speed manual gearbox and SynchroRev Match bears a Manufacturer’s List Price of $74,990, while the seven-speed automatic with Downshift Rev Matching is priced at $77,990 (plus dealer delivery and statutory charges)*. “It will be no surprise for customers to discover the new 2010 Nissan 370Z roadster delivers an exhilarating open air driving on top of the new 370Z coupe’s exceptional levels of performance,” says Dan Thompson, CEO of Nissan Motor Company Australia. “Nissan’s pricing for the 370Z roadster, as with the 370Z Coupe, positions it as the best value high performance two-seater sports car available,” Thompson said. NOTE: Prices exclude dealer delivery fees and the various statutory charges.